March 15, 2015: Airwheel Technology Holding ( USA ) CO.,LTD. has come out with a news story that is sure to surprise everyone and more so, the fans of Mos Patiparn, one of the most popular and phenomenal singers from Thailand. In his recent concert that was held to mark the 25 th anniversary of his debut, he surprised everyone and the fans who thronged the venue with a highly impressive electric unicycle show. It was a pure white Airwheel X8 Model unicycle he rode during this show and caused a sensation among his fans. Airwheel Technology Holding ( USA ) CO.,LTD. takes pride in pointing out that their brand is universally leading and globally popular and their electric unicyle is known for providing trenders a unique and fun way not only for commuting but for working out as well. Mos Patiparn conquered the hearts of his fans with his free and smooth style on the unicycle X8 of theiir company during the show, proudly points out Airwheel Technology Holding ( USA ) CO.,LTD. When he stole the limelight by riding the unicycle during the show, his fans screamed to cheer him and were enjoying his style. The company adds that their one-wheeled scooter Airwheel X8 comes in black, while and carbon-fiber pattern colors. With a 16in slim wheel hub and an intuitive system that integrates a premium Li-ion battery and an intelligent chip, their unicycle provides agile and smooth steering experience to the users. That is the reason the company has gained a prestigious reputation among unicycle enthusiasts and fans throughout the world. This is not the first time Airwheel products have been used by celebrities. Earlier, Spencer Matthews, the star of “Made in Chelsea” rode an Airwheel product on the streets of London. The company has distributors in more than 200 countries and in different regions of the world. More than 2 million users from every part of the world enjoy their products as Mos Patiparn does, points out the company. The company adds that they present 3 product lines and they are the one-wheeled X-series, the twin-wheeled Q-series and the intelligent scooter S-series and that theiir product lines are favored by a myriad number of celebrities as well as professionals. They emphatically assert that they are committed to developing trendy and handly electric unicycles. They are also equally concerned about the environment and hence, the electric unicycles they make are eco-friendly as well so Mother Nature is not put to jeopardy in any manner. About Airwheel Technology Holding ( USA ) CO.,LTD. 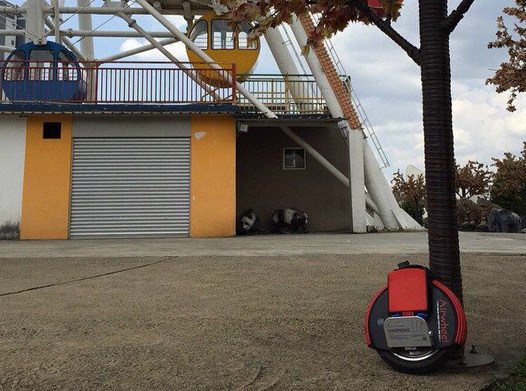 Airwheel Technology Holding (USA) Co. Ltd. is making 3 product lines of unicycles. Their products are liked both by celebrities and professionals. Recently, the popular Thailand singer, Mos Patiparn, rode a pure white Airwheel X8 Model unicycle during his show that was held to commemorate the 25th anniversary of his debut. The products the company makes can be used for commuting as well as for working out. Next：How to choose an optimal intelligent electric scooter?